Looking for a fun job? Ready to work? Paintball jobs might be right up your ally! 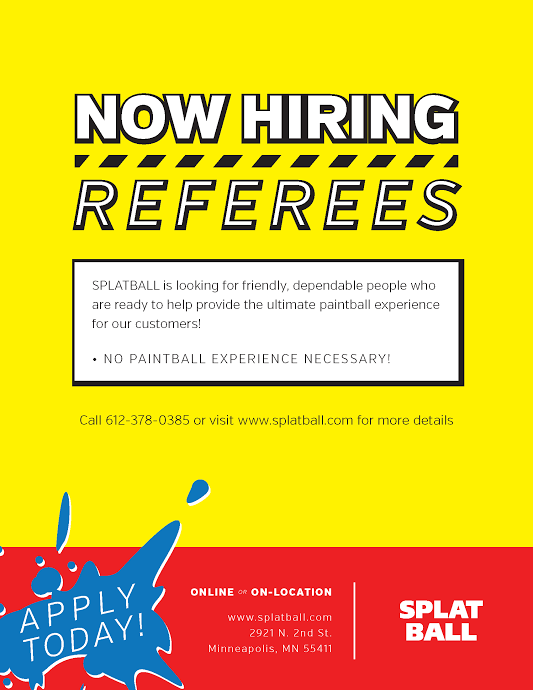 Splatball is always looking for new employees with or without any paintball experience. Whether you are new to the game or an experienced player Splatball looks for fun, personable, outing and energetic individuals. Employees will be responsible for supplying customers with a safe and fun environment to experience paintball the way it was intended…FUN! Paintball referee staff members are to maintain the paintball facility, gear and customer interactions. Splatball – Minneapolis strives to make sure both players and spectators are escorted at all times. Splatball in Minneapolis offers paintball jobs at the best indoor paintball center in the Minnesota to trustworthy, motivated and dependable people. If you are looking for a occupation and are not afraid to work hard and get a little dirty please check out our facility to learn more. Staff members will conduct safety briefings, game play, staging area regulations and more. Splatball Indoor Paintball is currently accepting applications for both entry level paintball referees and management positions. Become a part of one of the best paintball centers in the Midwest today! If you are interested please download our job application online and fill it out at your convenience. Applications may be dropped off at the front counter anytime during open hours. If you have any questions about applying or positions available please call us at 612-378-0385.